First memory of being on a boat: My first sail, when I was just weeks old, was in a sloop owned by my great-grandfather, built by my grandfather, and named for my mother, but I don’t remember that. I’m told that I fell down the companionway of my grandfather’s Aage Nielsen cutter Northern Crown, when I was about 3, but I don’t remember that, either. I vaguely recall the sailing as being a good time, though. First boat you owned (or skippered): My Bridges Point 24 Ellisha. I’ll always keep that boat; she’s the perfect daysailer. We get underway in about 2 minutes. She’s got a generous rig, no engine and can sail circles around lots of other boats her size. Last or current boat (owned or skippered): Owning a boatyard makes owning boats pretty easy, so there are more than a couple. Two years ago, I purchased a 28-foot lobster boat called Spare Time. 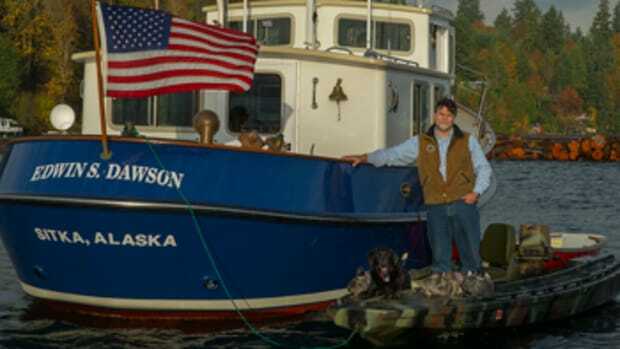 Donnie Trundy, formerly of Billings Diesel and Marine in Stonington, built her. He took plans for a 36-foot Arno Day boat and scaled them way down. He did a hell of a good job. I called him up when I bought the boat from a guy in Portland. 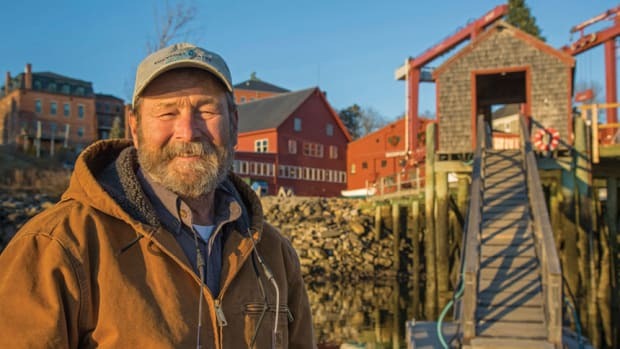 Donnie says he built the boat in 2 years of nights and weekends, including cutting all the cedar, then fished something like 300 traps in his “spare time.” The lobster boat is the perfect family vessel right now. We tow a peapod I built with a nice sailing rig and a carbon fiber dagger board. On the house top, we carry a peach-colored 11-foot skin-on-frame canoe I built for my young daughter. She named it Sail Away Unicorn. Favorite boat you’ve owned (or skippered): If I could only have one, it would be the peapod. I actually own two, both of my grandfather’s design. A buddy and I take them for a 3-mile row twice a week. He doesn’t know it, but his is a little slower. Your dream boat (to own or skipper): I have a list that I update sometimes. There’s a Newbert & Wallace lobster style boat called Caribou, formerly owned by Giffy Full, that gets my attention. And I’m always stunned when I see the Alden schooner Malabar II with her black hull, weathered bare teak trim, and self-tending rig. Do you prefer building boats or sailing them: I like the intersection where the sailing is proving the building. The most satisfying thing for me is to use a boat just as it was intended and to prove out the design and construction details with an understanding of how it’s meant to operate. Both are exercises in team work and improving your own abilities. Around here, building boats is much more fun in the winter. Your most memorable boating experience: I led the build of the 50-foot Fontaine-designed sloop Arabesque. Not my favorite design – she’s too complex and modern for my taste. My daughter was about 5 days old at the launching. I’d led the project with guys who had worked at the boatyard since I was a kid. A lot of my family came; we served oysters that my wife and brother-in-law raised. Friends that I’d worked with at Brooklin Boatyard came. It was a proud moment on many levels and the boat sails very well. Longest time you’ve spent at sea without setting foot on land: Just a few days. Commitment has never scared me in other aspects of my life, but I tend to want more space than a boat at sea can provide. Favorite destination so far: There are some anchorages in Eastern Penobscot Bay that I don’t advertise. Favorite nautical book: Amaretto by Joe Upton comes to mind. It’s about the sardine industry here in the early 1980’s. I really like the sardine carriers and think that running one of those boats would have been a terrific job to have. For a couple of summers, I ran the 83-foot carrier Jacob Pike when the Penobscot Marine Museum owned her. We weren’t carrying fish, but those boats are such a pleasure to operate and they look fantastic. Taylor is restoring the 72-foot carrier William Underwood in the back of our shop. I hope more people will catch on and convert those boats. 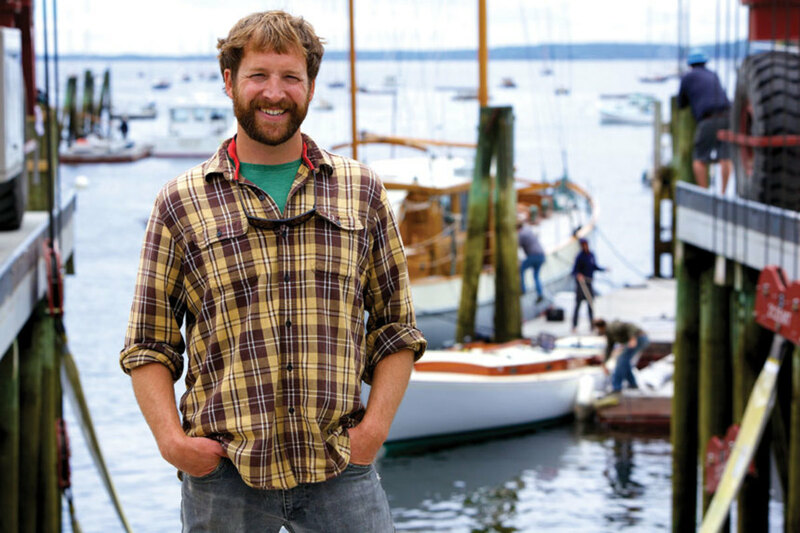 Favorite nautical cause you support and why: I support the trade schools, mostly in an effort to support Maine boatyards. The jobs here mean a lot to people and to the flavor of the area. Being able to employ good people is maybe the greatest measure of our success. I like to give a person a foundation to succeed in work they enjoy. We’ve often had people change job descriptions at the boatyard based on a skill set they developed while working here. I like that. 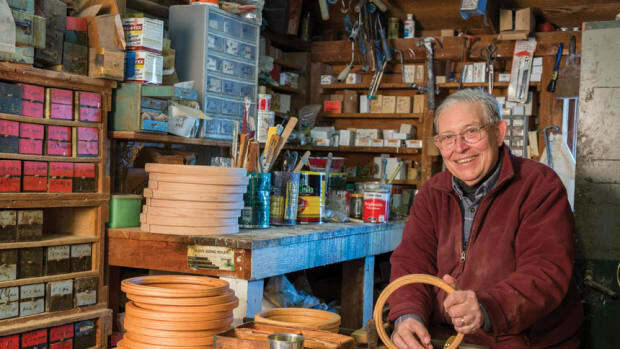 Ralph Johnson developed a taste for the sea more than 60 years ago, but his “moment of clarity” came in 1980 when he decided to take a couple of years off from a banking career to learn boatbuilding from his father-in-law, Pert Lowell. Lucky John England. The former master shipwright at Rockport Marine, in Rockport, Maine, England has probably never worked on an ugly boat. Mike Muessel grew up on Lake Superior in Duluth, Minnesota, the son of a career Coast Guard warrant officer. His family owned a 26- foot wooden launch and a 25-foot wooden sailboat that received heavy use. On any given day, you’re likely to find Chesapeake Bay photographer Jay Fleming mucking through a mosquito-ridden marsh, kayaking around a fleet of workboats or diving head-first into a net full of fish.